Aupair-World.net has one price for all, with the option of extending membership for a reduced fee. It is a cheerful looking site with all the features you would expect such as basic search and also searches matching the requirements in your profile. On the au pair search page there is a section devoted to "related questions". One question answered is: "How do I know that the au pairs displayed are still looking for a placement?" The response is that this is taken care of through a number of measures, namely the start date being current. Also, only au pairs who have logged on to their profile in the last 14 days are listed, and au pair profiles are deactivated when they have a large number of unanswered messages or have already been matched. Aupair World claims to check the members' profiles using both automated and manual procedures. Their security measures include deleting profiles that have lain inactive for several months and omitting profiles from search features that have not been logged into for 14 days. They also check the plausibility and completeness of the profiles and carry out random checks from time to time. In many cases, Aupair World asks for proof of identity, and also asks for further information if the user has behaved suspiciously. They warn users of common scam methods and remove profiles of anyone who has disobeyed their basic principles of aupairing. Aupair World clearly states what their basic principles of aupairing are so that there is a clear definition with regard to expectations on either part, the family and the au pair. They state that the role of the au pair is to carry out tasks related to caring for children, and can include ironing and cooking. They state that "An au pair's task is NOT: cleaning, ironing, taking care of elderly people, teaching languages, animal-sitting and the au pair is not a "harvest laborer." Other issues such as pocket money, board and lodgings are also addressed, as are the forming of a contract, travel expenses and further costs to be expected. It is important that these sorts of issues are stipulated on a web site catering for au pairs because the au pairs can easily fall into abuse, or the arrangement can lead to misunderstanding - particularly where foreign languages are involved. The au pair experience should be an enjoyable and rewarding one. This website lays out clear guidelines for its use as an au pair matching service. There is the option of translating the pages into German, Spanish, French, Italian and Dutch. A nice feature of this website is the "references" section. 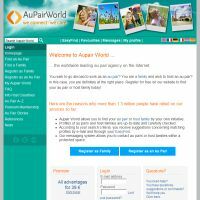 If you click on this tab you come to a page with a gallery of photos of Aupair World members - families and au pairs. By clicking on a photo you can view a nicely presented box and read what they have to say about their experiences with Aupair World. These profiles have been carefully selected to show the success of the site, and there is one highlighted au pair at the top with a video of a day of her au pair experience, filmed by Aupair World. This gives a homely touch and should increase confidence in the website as it shows that the use of the site is well monitored. Why not see for yourself?